Plot: Danton takes place in the spring of 1794, almost five years after the fall of the Bastille and immediately following a period when the revolutionary government, facing internal enemies, conspirators, and the advance of foreign armies on French territory, created the Committee of Public Safety and the Revolutionary Tribunal to repress its enemies and raise additional military forces. Robespierre and Danton became the Revolution’s leading figures, and huge numbers of suspects were arrested and executed, including Marie Antoinette and the liberal-thinking Duc d’Orléans, during what became known as the Reign of Terror. But the Revolution began to turn on itself, with Robespierre gradually gaining ascendancy over Danton and establishing dictatorial control through the tribunal and the committee. Robespierre believed that “terror is nothing other than justice, prompt, severe, inflexible,” while Danton and his faction gradually turned against the Terror and the dictatorship. Soon after the committee had eliminated the extremists under Jacques-René Hébert (an atheist and proponent of the working class), it turned on Danton and his faction, the Indulgents. Wajda barely touches on these historical facts, however, except for Danton’s execution, focusing instead on the conflict between Robespierre and Danton. 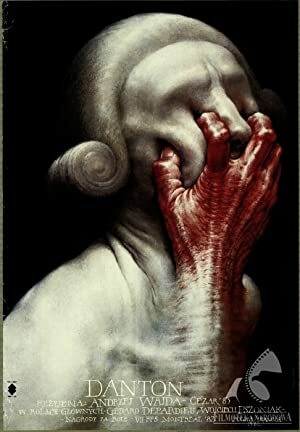 We are presented with Gérard Depardieu’s passionate, gesticulating, anarchic force of nature Danton, who, with one last grand gesture, goes to the guillotine declaring that the people should be shown his head after the execution, and Pszoniak’s more intellectual, chill, and neurasthenic Robespierre. The hostility that the two men, both of them middle-class lawyers, feel for each other is as much personal as political. Depardieu’s Danton is bulky, sloppy, bombastic, and corrupt—a man who loves to eat, drink, and live in luxury. He once supported the execution of the moderate Girondists but has tempered his political positions and now wants to provide a normal life for the people. He asserts: “I’d rather be executed than be an executioner.” Robespierre is his opposite—sickly, slight, ascetic, and idealistic (“the incorruptible”). He sees the Terror as a revolutionary necessity (though the counterrevolution has by this time been suppressed), the only way to maintain the Revolution’s impetus, since he perceives it as having lost its will and energy. Despite their profound differences, Robespierre, knowing that rejecting the popular Danton could be politically dangerous, wants to unite with him to consolidate the power of the committee. But Danton refuses to conciliate, and though a great deal of political maneuvering and speechifying follows, his fate is inevitable. A prime cause of Danton’s defeat is the fact that Robespierre is the superior political strategist and infighter. Danton is much too dependent on and complacent about the people’s adoration, and in turn does little to protect himself. In fact, he seems worn out emotionally, and politically careless and obtuse. He defends himself by appealing to the Convention (the Revolution’s legislative body), but it turns out to be fickle—Danton’s charisma, eloquence, and bravado are insufficient to save his or his followers’ lives. Wajda’s reduction of the conflict to the two men and their various followers (who are merely sketched) jockeying for power may simplify history, but it’s dramatically effective and never turns into mere orating, with the two leads strikingly able to grant life and dimension to these outsize personalities. Of course the director’s sympathies clearly lie with the self-indulgent, utterly human Danton, a much more likable figure than the logical, austere Robespierre. But Wajda avoids the agitprop trap of turning Robespierre into a cardboard villain. He humanizes this rigid character and shows him to be a man left without a real political choice, oppressed by his feeling that the triumph of the Revolution is no longer possible: if Danton is not killed, the Revolution is finished; but if he is, it is also doomed. Robespierre also tries to save his pamphleteer friend, and Danton ally, the fragile Desmoulins (Patrice Chéreau), for whom he has genuine affection. He is far from a bloodthirsty man. It’s his main ally, the wild-eyed fanatic Louis de Saint-Just (Bogus?aw Linda), who has no qualms about calling for his opponents’ heads, and who attends to the sentencing and execution of Danton and the other defendants while Robespierre, looking sick and haunted, hides in bed, sensing that it has all collapsed—“The Revolution has taken a wrong turn”—and that his own destruction is imminent. Soon, of course, with the repression accelerating, Robespierre’s fears would be realized in the Thermidorian Reaction of July 1794, when several of the surviving leaders of the Reign of Terror were executed, including Robespierre and Saint-Just. — Leonard Quart is Professor Emeritus of Cinema Studies at the College of Staten Island and the CUNY Graduate Center, as well as a contributing editor of Cineaste.